York, or Richard Plantagenet, is a young lord who begins the play fighting to reclaim the title his father lost for treasonous actions against Henry V (the famous traitor scene in Henry V). He also wants to claim his grandfather’s lands as the Duke of York. His most avid opposition comes from Somerset. In the Temple Garden scene York chooses the white rose as his symbol, the white rose symbolizes the York family, and lands to this very day. York eventually does reclaim his titles, and is made regent of France. He is more level headed than Somerset, but still has a bit of a temper. The following information is quoted from the Oxford Dictionary of National Biography, written by John Watts. Richard of York, third duke of York (1411–1460), magnate and claimant to the English throne, was the only son of Richard of Conisbrough, fourth earl of Cambridge (1385–1415), and Anne Mortimer (b. after 1388, d. before 1414), daughter of Roger (VII) Mortimer, fourth earl of March. 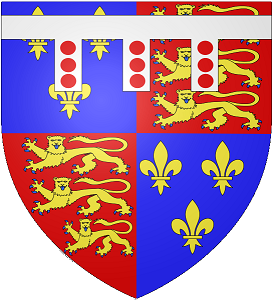 He was descended from Edward III through both parents, his father being the son of that king's fourth son, Edmund of Langley, first duke of York, and his mother the great-granddaughter of Edward's second son, Lionel of Antwerp, duke of Clarence. It was this distinguished ancestry that provided the basis for his explosive participation in the troubled politics of the 1450s. In October 1460, after a decade of agitation and intervention, he attempted to seize the throne on the grounds that his descent from Clarence made him rightful king in place of Henry VI, who, like the other Lancastrian kings, was descended from Edward III's third son, John of Gaunt, duke of Lancaster. The attempt failed, and York died a few months later at the battle of Wakefield, but the claim, of course, lived on to provide the basis for Edward IV's succession in March 1461. Richard of York was born on 22 September 1411, to parents who had married in secret and were soon to be dead. His mother was gone within a year or two; his father, who married again in 1414, was executed the following year when details of his plot to depose Henry V came to light. Cambridge's plan to raise the north and (apparently) to put Edmund (V) Mortimer, earl of March, on the throne must have thrown his son's dynastic position into sharp relief: the young Richard's mother had been the elder of March's sisters, which made the boy himself a possible heir to the Mortimer–Clarence claim to the throne. On Cambridge's death he became a royal ward, and it is not altogether surprising that in March 1416 he was placed in the custody of the Lancastrians' leading gaoler, Sir Robert Waterton. Three years into his reign, however, Henry V was busy laying to rest the divisions of his father's time and Richard of York was destined for rehabilitation. He was protected from the effects of his father's attainder and, on the death of his uncle Edward, duke of York, at Agincourt, the boy was recognized to be his heir. Not long after Henry VI's accession York's wardship and marriage were sold to Ralph Neville, earl of Westmorland. At 3000 marks the price was a high one, but Neville's investment was amply repaid when, in January 1425, Edmund, earl of March, died childless, and York, as his nephew, became heir to the extensive Mortimer inheritance. At some stage in the 1420s, possibly as early as 1424, the young duke was married off to Cecily Neville (1415–1495), one of Westmorland's daughters with Joan Beaufort. From the point of view of the Nevilles, who had married into most of the leading magnate families of the day, it was a prestigious match that helped to confirm the family's growing pre-eminence; from the point of view of Henry VI's government, it was an ideal way to absorb a potentially dangerous figure by attaching him to some of the dynasty's staunchest supporters. Over the next few years York was drawn more closely into the circle around the young king. In 1426 he was knighted, and two years later he was appointed to take up residence in the royal household. In 1430 York took part in the king's coronation expedition to France. His retinue was small, but he was handsomely rewarded for his involvement: over 1000 marks by the summer of 1431. Soon after his return, and still a minor (though there appears to have been some uncertainty over this at the time), he was granted livery of his estates on 12 May 1432. At the time both inheritances were encumbered with debts, dowers, and obligations, while the duchy of York was mainly in the hands of feoffees. By the summer of 1434, however, a series of financial settlements and the deaths of the two remaining dowagers had lifted the worst of these burdens, and the duke was free to enjoy his extensive patrimony undisturbed. The acquisition of his inheritance had cost him quite a lot, but he had received fair—even generous—treatment from the government. York's proximity to the king, both in blood and in person, and his links with the families of Neville and Beaufort had stood him in good stead. In 1433 York was admitted to the Order of the Garter—a mark of favour, a certificate of loyalty, and perhaps a token of martial expectations. His first taste of military command was to be as successor to John, duke of Bedford, in the lieutenancy of France, a post for which he was, in many ways, the obvious candidate: the royal commission, dated 8 May 1436, recited the king's desire to see France ruled by ‘some great prince of our blood’ (Johnson, York, 226), and there was no one else who fitted the bill, apart from Humphrey, duke of Gloucester. York had agreed to serve in France as early as February 1436, but his army did not reach Harfleur until 7 June. Had it left England more promptly, it might have been able to prevent the French reconquest of Paris and the Île-de-France, which took place during the spring, though it is difficult to know where the blame for the expedition's dilatoriness should lie: York was also to be late leaving for his second tour of duty in 1441, and the government was sceptical of his excuses on both occasions, but recruiting an army was no easy feat in the later stages of the Hundred Years' War, and delays were probably unavoidable. In the event the French advance was halted by York's forces. The brilliant campaign of autumn 1436, which ensured the safety of Rouen, was actually commanded by John, Lord Talbot, but Duke Richard too seems to have carried out some useful work, regaining most of the Pays de Caux after the rebellion of 1435, attending to the grievances of the Normans, and surveying the English garrisons. During both of York's lieutenancies it seems to have been a policy of his to delegate the basic management of the war to leading captains: his retainer Talbot, as marshal, in 1436; his brother-in-law Richard Neville, earl of Salisbury, as lieutenant-general in 1437; and Talbot again as ‘lieutenant-general for the conduct of the war’ (Pollard, 39) during York's second tour of duty from 1441. Although the duke and his council retained overall control of military policy throughout, it may be that York saw himself more as a viceroy, responsible for government as a whole, than as a warrior. This is certainly implicit in the attention that he gave to matters of domestic governance in Normandy and the pays de conquête: it was for his good rule of the duchy and for his genuine attempts to deal with the problems created by a declining military occupation that York would be remembered in France. His role in the fighting of the war was undistinguished, and a number of English chroniclers noted the fact. Faced with the imminent expiry of his indentures—though not of his lieutenancy, the term of which was indefinite—York sought permission to return home in the spring of 1437. His successor was to be the earl of Warwick, and York was instructed to remain in Normandy until his arrival, which was delayed until the following November. It is difficult to know whether the decision to replace York reflects disappointment with his performance or not: the duke may even have wished to stand down, possibly because of difficulties in extracting money from the Norman exchequer for the payment of his troops. In any event Warwick's service was soon cut short by his death in April 1439, and Henry VI's government found itself once again faced with the task of providing for the rule of Lancastrian France. It was apparently as a compromise candidate that York emerged as the new lieutenant on 2 July 1440: Gloucester appears to have sought his own appointment, while Cardinal Beaufort, the regime's paymaster, probably pressed the claims of his nephew John Beaufort, earl of Somerset. York, however, was the most suitable choice for a post which now, more than ever, demanded a flexible, diplomatic, and authoritative holder: as the government pursued both peace and war with greater vigour than before, the duke was sufficiently neutral, consultative, and grand to act effectively on its behalf; he was also well connected with all parties, including the military establishment in France. On this occasion York demanded adequate funding and increased powers before he would accept the job: he went to France as a second Bedford, with all the powers that Duke John had enjoyed after 1432 and a promise of £20,000 a year from the English exchequer to fund his troops. Apart from these improved terms of service, however, the patterns of the first lieutenancy were repeated. York left England late, not arriving in Normandy until the end of June 1441. He then moved speedily down the Seine to Pontoise where Talbot was struggling to lift Charles VII's siege, but this was to be his only military action in the three years before the truce of Tours. It was not a particularly impressive one: if York had helped to secure Pontoise for a further few months, he may also have frustrated a daring scheme of Talbot's that could have resulted in the capture of the French king. Caution, it seems, got the better of York, and not for the last time in his career. Over the next few years the duke busied himself with matters of governance and diplomacy while the war effort in Normandy ground slowly to a halt. In part this was because Charles VII had turned his attention to the south-west, but it is clear that York's reluctance to engage the French directly caused dissatisfaction in the English government and it may help to explain why Cardinal Beaufort was able to engineer a major military command for his nephew John. The earl of Somerset's expedition, planned from late 1442 and launched in the summer of 1443, involved a major diversion of men, funds, and authority away from York and the Norman theatre. Duke Richard dispatched an embassy to remonstrate with the English government in June 1443, but it had no effect, and the campaign itself added injury to insult: Somerset's attack on Brittany and the duke of Alençon's stronghold of La Guerche disrupted York's attempts, conducted during 1442–3, to involve the English in an alliance of French princes. In the light of all this it is hardly surprising that, following the expedition's failure, the government seems to have felt the need to appease York: tallies for the payments due at Michaelmas 1443 arrived in February 1444 and, later in that year, the duke was given a major apanage in southern Normandy, while earldoms (and, in Edmund's case, lands) were granted to his eldest sons. After this no more of York's wages were paid until 1446, but at least the truce contracted in May 1444 reduced his expenses and removed the need for further military activity. In September 1445 York returned to England: his indentures were about to expire, parliament was in session, and—rather ironically, given the government's own failures in this regard—his management of Norman finances was under investigation. It now seems clear that Cardinal Beaufort, William de la Pole, earl of Suffolk, and the other leading councillors and courtiers who, in the first instance, managed Henry VI's authority in the 1430s and 1440s intended Richard of York to be a pillar of the Lancastrian regime. This did not mean that the already wealthy duke was to be showered with gifts, nor did it mean that he was to be given a formal role in the government of England. York was not, for example, appointed to the re-established council in November 1437, but nothing should be inferred from this: at twenty-six the duke would have been considered rather youthful for what was in any case a rather anomalous role; exclusion from the council would scarcely have excluded him from influence; and it is likely that already the expectation was that his service to the crown would be overseas, at least while he was of military age. It is not known what part, if any, York played in the politics of 1437–41, during which time he was in England and Henry VI, somewhat uncertainly, came of age. There is no reason to suppose that he supported the moves of Humphrey, duke of Gloucester, against Cardinal Beaufort in 1439–40, despite Gloucester's suggestion that York and other lords had been wrongfully kept out of power; nor should it be assumed that he was opposed to the release of the duke of Orléans. He seems to have kept a low profile at this time, participating in a scheme to restore order in Wales in 1437–8, sharing in the custody of the Beauchamp wardship in 1439, and touring his estates. When, in early 1441, the ‘longe bareynesse’ of his marriage was suddenly ended and a son born, York named him Henry (Bokenham's Legenden, 273). This demonstration of dynastic loyalty earned a gift of £100 worth of jewels from the grateful king: the restoration of the heir of Cambridge and Mortimer must have seemed to be complete. As lieutenant of France for the second time York became embroiled in the government's various diplomatic initiatives, including the moves associated with the truce of Tours. It has often been assumed that Duke Richard was hostile to the peace negotiations of the 1440s, but there is absolutely no evidence for this. While the confusions of policy in the early years of the decade must have been exasperating for anyone charged with responsibility for the defence of Lancastrian France, there is nothing to suggest that York preferred war to diplomacy as a means of preserving English interests. As the plan to seek a truce with Charles VII and a marriage alliance with the house of Anjou emerged as the central plank of royal policy in 1444, York seems to have given it his full support. In the new spirit of Anglo-French amity, for example, he sent forces to assist the dauphin's campaign in Alsace in the summer of 1444. The following year, and possibly in response to promptings from the government, he opened negotiations for a marriage between his eldest son (now Edward of Rouen—the future Edward IV—born on 28 April 1442) and one of the French king's daughters. The duke may even have been sympathetic to the government's plans to surrender Maine, which proceeded alongside the truce negotiations and formed an integral part of the alliance policy. Because of the postures that York struck after 1450 historians have tended to assume that he was opposed to this notorious scheme, but that is by no means clear. It is very likely that he knew what was planned by the end of 1445 (if not earlier, since he met Suffolk's embassy as it travelled through Normandy in 1444) and he was certainly involved in the arrangements for compensating Maine's English landholders in 1447. Interestingly York was never explicitly to condemn the handover of the territory, although its loss was certainly a prominent feature of popular and parliamentary criticism of William de la Pole, by then duke of Suffolk, Edmund Beaufort, duke of Somerset, and the other so-called ‘traitors’ of 1450. It is from the period following his return to England in 1445 that York's alienation from Henry VI's ministers is often supposed to have dated. The duke found himself accused of mishandling the funds he had been paid for the defence of Normandy, and his chief accuser, it appeared, was a central figure in the government, Adam Moleyns, bishop of Chichester. York had returned to England confident of reappointment to the French lieutenancy, but he was obliged to wait for more than a year and then to see the office go to Edmund Beaufort instead. It used to be thought that because of his alleged hostility to the peace policy, and his putatively close links to the duke of Gloucester (who died mysteriously in 1447), Duke Richard was persona non grata with Suffolk's regime: his appointment to the lieutenancy of Ireland on 30 July 1447 has sometimes been seen as a form of exile, the government's hope being that, like the earls of March, his predecessors, he would go there and die. However, events thus far do not support this interpretation. York was certainly dismayed by the rumours concerning his performance in Normandy, but he was explicitly vindicated by king and lords both in and outside the parliament of 1445–6; it is not even known that Moleyns had made the accusations York claimed, only that the duke saw in a public attack on the bishop the opportunity to clear his own name. Similarly, while York was probably disappointed not to regain the lieutenancy of France, too much should not be made of this: the lieutenancy of Ireland, which he was granted in return, was a post that his most distinguished ancestors (notably Clarence himself) had held; it bestowed upon him almost sovereign powers in the island; and it gave him the opportunity to combine military service with the exploitation of his interests as an Irish landlord. Finally, since the terms of his commission permitted him to appoint a deputy and return to England, it cannot be seen as a form of banishment. In some ways, indeed, 1446 and 1447 saw York more closely involved in the governing regime than he had ever been: in October 1446 he was granted the abbey and town of Waltham because he ‘will come often to London for the king's business and his own’ (CPR, 1446–52, 43); over the next year he attended a number of council meetings and was named as a witness to more than three-quarters of the charters issued from 1446 to 1448; during 1447–9 he was added to the peace commissions of eleven counties beyond those to which he had been named at his inheritance (and in some cases beyond the scope of his landholdings); and finally, almost for the first time, he began to enjoy the kind of rewards more commonly bestowed on courtiers—most notably, perhaps, the wardship and marriage of the Holland heir (Henry) and a series of lands and offices once held by Gloucester. This last detail is a reminder that there was almost nothing to link York with Duke Humphrey in the latter's lifetime: in no sense can York be considered his supporter, and it is not improbable that, like other members of the nobility, he witnessed Gloucester's destruction at the Bury parliament and, tacitly at least, assented to it. When he finally left for Ireland, in June 1449, Duke Richard did so as a loyal and well-regarded member of the Lancastrian establishment. If he had been less involved in affairs during the preceding year or so, this may well have been at his own choice. Many of the nobility seem to have withdrawn from the court during 1448 as the government's troubles began to mount. York cannot have wished to be associated with the humiliating surrender of Le Mans in March 1448 and he may well have feared the consequences of the extraordinary coup at Fougères. A tour of duty in Ireland must have appeared an attractive alternative. During his fourteen months in the province York scored a series of easy (if short-lived) victories, receiving the submission of most of the island's leaders and campaigning effectively in Wicklow. At the Drogheda parliament of April 1450 he followed the lead of the Commons at Westminster by introducing an Act of Resumption. Like the lieutenant of France he was short of money, and this limited his achievements, but the contrast between this vigorous performance and the demoralizing stasis of Somerset's rule in France must have impressed itself upon contemporaries. By the mid-1430s, when he had gained full control over his estates, York was the richest and most extensive landowner among the king's subjects. Estimates of his wealth have varied between £2874 and £5800 net, but the most recent and reliable estimate suggests that his estates in England and Wales were worth about £4000 a year (net) when he came into them, and that his exchequer annuities yielded an average of £600 a year. York's lands were scattered through England and the march of Wales, with notable concentrations in the West Riding of Yorkshire; in Lincolnshire and Northamptonshire; in Dorset and Somerset; in Herefordshire, Shropshire, and the middle march of Wales; and in the centre of East Anglia along the border of Norfolk and Suffolk. Beyond this he held the earldom of Ulster and the lordships of Connacht and Trim, although only the last of these Irish estates is likely to have yielded York any real influence or income. The possession of such vast holdings shaped York's activities as a lord: like John of Gaunt before him he was a truly national figure, with interests so widespread and diverse that it was difficult for him to exert the kind of local authority typical of later medieval magnates. He had no real ‘country’—no county-sized area of concentrated influence where local gentlemen might turn first of all to him for lordship—and this helped to determine both the nature of his affinity and the role that he and it were to play in the politics of the realm. York's following, like Gaunt's or indeed the king's, was a disparate group of often important men, many of whom had their own local allegiances and whose links with York were forged mainly through military service and the tenure of estate or household office. In part, of course, this pattern was a consequence of the duke's long minority and his prolonged service in France: many of the servants of the duchy of York had melted away in the 1420s into Gloucester's service, for example; while Duke Richard's appointment as Bedford's successor in Normandy presented him with a ready-made following looking for a lord. 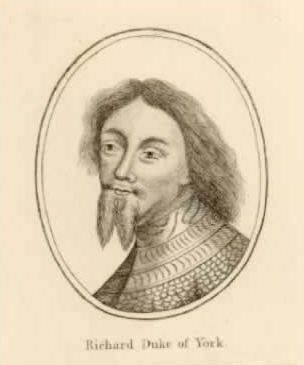 A spry comment from an anti-Yorkist chronicler has promoted the suggestion that York was unduly influenced by the men who gathered round him in Normandy—in particular, by Sir William Oldhall, who was one of York's most reliable agents during the 1450s—but there is little to support this notion, particularly when the duke's involvement in the peace policy of the mid-1440s is taken into account. On the contrary, it seems likely that York's high status, his extensive interests, and his relative disengagement from the affairs of any particular locality beyond his estates meant that he was exposed to a wide array of different voices. If anyone besides the king and his ministers was likely to hear the counsel of the realm, it was surely York, who numbered lords such as Talbot, Ralph Cromwell, and Thomas Scales among his councillors, but also enjoyed links with exchequer clerks, lawyers, the widows of Norman soldiers, and local worthies from all parts of the country. The maintenance of this kind of connection may have cost York dear—as much as £1300 a year, according to one recent estimate—but it seems that his money was well spent. Despite his inability to offer really consistent local support, he was apparently able to co-ordinate the raising of large retinues throughout the 1450s. If some of his servants kept away from the duke's more controversial ventures, a sizeable and prestigious core remained loyal to the end. The last and best-known period in York's political life began in September 1450, when he suddenly returned from Ireland and took up the common cry for the traitors surrounding the king to be brought to justice. This was a significant change of political direction for the duke, and one that shaped the remainder of his career, but the reasons for it are not immediately obvious. Modern historians have mostly rejected the traditional interpretation, which laid stress on York's dynastic interests and saw his participation in the popular ferments of the 1450s as a device for seizing the crown. Instead, the search has been for the causes of personal grievance on Duke Richard's part: was he moved to anger, or even desperation, by the government's enormous debts to him? Was he incensed by the new pre-eminence of Edmund Beaufort, duke of Somerset, the man who had so recently lost France? Did he fear for his own position, as an old rival took control of Henry VI's government? Alternatively, was York simply an opportunist, moving (typically late) to exploit the regime's difficulties, but without any fixed idea of where his dissidence might take him? One difficulty in reaching any conclusions lies in trying to establish which elements of York's programme, as this slowly unfolded, were intentional, and intended from the start. 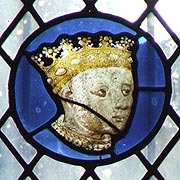 It is certainly unlikely that the duke was seeking to gain the throne in 1450: previous legitimists had soon revealed their desire to improve the realm by changing the king, but York was not to assert his Mortimer–Clarence claim until 1460, after ten years of activism explicitly devoted to other ends. Even in that year, moreover, his move was greeted with hostility, and it seems reasonable to suggest that the duke would have known all along that this was a likely reaction and would have trimmed his policy accordingly. It is possible that, in 1450, York was concerned to secure recognition as heir presumptive to Henry VI: the king was still without a child and there was a (somewhat faint) possibility of dynastic competition from the house of Beaufort. Like most noblemen York took an active interest in the claims and titles he possessed—in 1445 he had sought information on his interest in the throne of Castile and in 1451 an agent of his was to argue in parliament that the duke should be named as heir apparent—but, at best, this can provide only a partial explanation for his actions in 1450. As far as personal grievances are concerned, meanwhile, it is difficult to see what grounds York had for complaint. That the duke was part of the establishment in the 1440s has already been illustrated. Financially he had fared no worse than any of Henry VI's other major accountants: indeed, somewhat remarkably, given the state of royal finances, he received £1200 from the crown at the end of 1449, and even in May 1450 efforts were being made to find him money. He may have decided to return to England to seek funds—a letter to Salisbury, written in June 1450, suggests that he feared serious losses in Ireland unless he received further payments—but this is rather a different matter from acting on a sense of grievance, and if seeking money was York's initial aim, it was soon overwhelmed by other purposes. What, finally, of York's famous antagonism towards Somerset: was this the motivation for his assault on the king's ministers? The problem here is one of disentangling the personal feud between the two men from the relative positions in which a wider politics had placed them: did York attack the government because it contained Somerset, or did he attack Somerset because he was the leader of the government? It is certainly possible to find grounds for animosity between the two men: Beaufort's performance in the last years of the war was undistinguished to say the least, and York may have thought that he himself could have achieved more; it has recently been suggested, moreover, that the lieutenant's casual surrender of Rouen would particularly have rankled with Duke Richard, since he had continued to be its captain. At the same time, however, it is clear that once York had made his inflammatory moves of September 1450 (and possibly even before then), he and Somerset were destined to be at odds: Duke Richard's political standing came quickly to depend on the argument that the government was run by traitors, and a large part of his justification for taking up arms in 1450, 1452, and 1455 was that the enmity of leading ministers obliged him to take action to defend himself; Duke Edmund, on the other hand, was not unjustified in regarding much of York's behaviour as threatening, both to himself and to the order of the realm; if he sought, in 1450, in 1452–3, and in 1455, to deal with the problem by repression instead of indulgence, it was an understandable approach. Politics, as much as personality and private interest, determined the conflict between York and Somerset. Pursuing this further, it may be suggested that it was in the extraordinary politics of 1450 that the most likely reasons for York's sudden attack on the government are to be found. As Normandy fell to the French and the king's bankruptcy was exposed in parliament, the authority of Henry VI's ministers disintegrated. MPs and more lowly members of society appeared to be united in the belief that the king had been betrayed by a self-serving clique who had pillaged his possessions in England and surrendered those in France. If Suffolk's trial and murder had removed the leader of the gang, the rest remained in positions of power, and until the king and the ‘true lords’ took action against them, there could be no justice or order in the realm. This judgement on the recent past dominated public life in England between 1449 and 1451, and it continued to exert a certain influence over the public imagination thereafter. York, like other members of the nobility, must have known that in certain ways it was wide of the mark, but this did not mean that it could be ignored. In particular, in fact, it could not be ignored by York, who had already been identified by some of the government's critics as the figure most likely to visit retribution upon the ‘traitors’. This appears to be the explanation for the rough reception that York and his men received at their landing in north Wales in September: local agents of the royal household, and possibly their commanders at the centre, had become alarmed about the duke's intentions. It was at this point, perhaps, and not in 1447, that ‘by treating [the duke] as an enemy the court had made him one’ (McFarlane, 405): if both the king's ministers and his subjects were going to cast York as the agent of justice, he might as well fulfil their expectations. Certainly, the moment must have seemed ripe for someone to take drastic action: the king's officers could not govern without public confidence, and it may have appeared that the removal of some of the discredited men—not least, perhaps, the duke of Somerset—was the best way to restore it. Beyond all this, it might be added that, even if the government had not moved against him in 1450, everything in York's make-up would have given him the sense that he was the man to restore the situation. He was the greatest prince of the royal blood, head and shoulders above other lords, the natural successor to Bedford and Gloucester in the protection of Henry VI's interests. He had already acted as the king's viceroy in France and Ireland; why not in England too? What, if anything, York knew of the deeds of men like Gaunt and Woodstock (or those of Montfort and Lancaster), whose status was much the same as his and whose actions were to prefigure his own, is not known; but one model of proper noble service had been made available to him when, probably in 1445, York was presented with an elegantly decorated translation of Claudian's life of the consul Stilicho. It was an account of how the people of Rome and other nations implored this virtuous prince to accept the office of consul and restore good government to a city torn apart by the evil advisers of a child emperor. Its translator had invited York to ‘marke stilicoes life’ (‘Mittelenglische Claudian–Übersetzung’, 256): in 1450 the moment had arrived when he might put this teaching to good use. It was with a volley of bills and open letters addressed to the king that York returned to English political life in September 1450. The first of these sought to establish the duke's loyalty; the second advertised his intention to seek justice against his accusers; but it was the third that was truly controversial—it drew the king's attention to the universal complaint that justice was not being done to those who broke the king's law with impunity (in particular, the so-called ‘traitors’), and offered York's services in bringing the guilty to book. This was an open defiance of the government's authority, since the essence of the ‘traitors’ idea was that it was the men about the king who were most of all responsible for the disasters that had befallen the realm. As far as York was concerned, this meant that a true subject was obliged to act against the inner circle of authority in order to fulfil the terms of his allegiance to king and realm, and this explains the duke's many affirmations of loyalty to King Henry: it was the essential justification for actions that, on the face of it, appeared disloyal. Under normal circumstances, of course, attempts to separate a king's chosen counsellors and servants from the ruler himself were unlikely to succeed: defiance of royal agents easily shaded into defiance of the king, and that was treason. As York and all the rest of the nobility knew, however, these circumstances were not normal: Henry VI had shown no more discernment than a child in the government of his realm; his ministers were virtually self-appointed, and the policies pursued during the 1420s, 1430s, and 1440s were essentially theirs. If this makes nonsense of one aspect of the ‘traitors’ thesis, it exposes the truth of another aspect: the government was not in any real sense the vehicle of the king's will, and thus defiance of it was not treason; the regime could legitimately be reshaped, and, with large sections of the public arguing that it should be, York's actions had a certain justice in them. In reality he was appealing not to the king with these manifestos, but to the Lords and to the wider public: his plea was that those who were less compromised by the disasters of 1449–50 must abandon those who were more immediately responsible; a new government, in which the duke was to play a more prominent role, must be established. Not surprisingly York's demands fell on deaf ears. The king's circle saw little reason for a general blood-letting, and the nobility, who had begun to lend support to the beleaguered regime as the crisis mounted, appear to have taken a similar view. In a public reply to York's bills, his offers of assistance were politely rebuffed, and the duke left London to prepare for the parliament summoned to meet in November 1450. When it gathered on the 6th, MPs demonstrated their continuing enthusiasm for reform by electing Oldhall, York's chamberlain, as speaker and loudly calling for the traitors to be brought to justice. When the duke himself arrived, with sword borne upright before him and a large army at his back, the initiative was his: Somerset was promptly imprisoned and the Lords waited to see what would happen next. What followed was in part a demonstration of Duke Richard's hesitancy and conservatism, and in part a reflection of the constraints of his position. Elements of the Commons' programme were put into effect, but the duke made no attempt to alter the institutional framework of Henry's government, and the result was that, during the Christmas recess, authority drifted back to the king and his household, Somerset was released, and the Lords, many of whom had flirted with York while he was in the ascendant, resumed their former obedience. During the sessions of the parliament in 1451 York's power waned, and Thomas Younge's notorious attempt to have him recognized as heir apparent must have seemed to many an act of desperation. Why had York not done more to secure himself during his brief ascendancy? It is not, of course, clear what he wanted: if only the restoration of order, then this was being achieved without his help; if a role for himself in the government, then his actions had made this unthinkable unless the king himself were to be altogether displaced—the men of Henry's household, who effectively disposed of royal power, were hardly going to welcome a man who had posed as their nemesis. What York had done, in effect, was to go too far without going far enough. Perhaps he should have cut his losses and risked a direct assault on the throne; but such a move was almost certain to fail. The duke had cast himself as the true liegeman of Henry VI: any deviation from this role was sure to be seen as the grossest kind of betrayal; York had many potential supporters, but—apart, perhaps, from his own servants—their support was for his public, not his private, interests. It has been worth looking at the events of 1450 in some detail, because for the next two years Duke Richard's options were very largely shaped by what had happened in that year. He could not be secure while Somerset and the household retained both control of the king and the support of the Lords, yet there was little he could do to improve his lot. Moves against Oldhall were under way by the end of 1451, and when, in January 1452, York reacted publicly against them and against their implications for himself, he was thinly supported. Apart from the duke's own men only the malcontent Thomas Courtenay, earl of Devon, and his crony Lord Cobham were persuaded to join the rising that attempted to repeat the coup of 1450: the rest of the nobility gathered around the king and Somerset, and York was forced to capitulate at Dartford in early March. His failure left him worse off than before. He was obliged to swear a humiliating oath of submission, his supporters and tenants were harried by judicial commissions, and his attempts to discredit Somerset were treated as part and parcel of a private quarrel. As the common people were reduced to order and the government enjoyed the unfamiliar taste of victory in Gascony, it seemed that York's political career was at an end: never again would he be able to take his proper place in the Lancastrian establishment. At this point, however, fate combined with the contradictions of Henry VI's regime to bestow new opportunities upon Duke Richard. In the summer of 1453 Somerset's governing consensus suddenly collapsed, as the victories in Gascony were reversed, the king lost his mind, and war broke out in the north between the Nevilles and the Percys. In the resulting crisis York was the only person of sufficient stature to restore the situation, and it must be this factor, above all, that explains the decision of a non-partisan group of councillors to summon him to London in October 1453, and the agreement in parliament to appoint him protector and defender of the realm on 27 March 1454. Here was a means for York to wrest control of government from Somerset and the king's household men without bringing his loyalty to Henry VI into question; and here was a means for the rest of political society to contain the powerful duke and to create an effective government without the kind of sacrifices that had been demanded in 1450. York certainly did his part: he went to London full of emollient promises to attend the council and do all ‘that sholde or might be to the welfare of the king and of his subgettes’ (CPR, 1452–61, 143); he made no attacks on Somerset or other sometime ‘traitors’ (though his ally, Norfolk, did); and, on taking up the post of protector, he committed himself to rule consultatively and representatively with the Lords. During the succeeding months York made serious and well-founded attempts to pacify the disputes in the north and north midlands, and he enjoyed some success. Making genuine efforts to consult widely, he demonstrated the same statesmanlike qualities that had marked his management of France and Ireland: ‘for a whole year’, wrote one chronicler, ‘he governed the whole realm of England most nobly and in the best way’ (‘Benet's chronicle’, 212). There were certainly limits to his achievement, and his tenure of office was to be brought to an abrupt halt in February 1455, but the duke's performance may have prompted many of his peers to look more sympathetically at his claims in the years to come. Unfortunately, however, the moulds of politics were changing in these years, and the broad unity that had so long been preserved among the nobility was breaking down. The deterioration of order in the localities, which had become so dramatic and extensive by 1453, was now combined with the emergence of a more aggressive Lancastrian dynasticism to promote significant divisions among the élite. These had begun to emerge even before York's protectorate: one of the reasons why it had taken so long to arrange the duke's appointment was that a substantial group of lords had grouped themselves around the queen, Margaret of Anjou, who—since the birth of her son Edward in October 1453—was attempting to secure a regency for herself. In the winter of 1453–4, indeed, civil war looked a distinct possibility. It was held off by York's readiness to make explicit his submission to the dynastic claims of the new prince, and by the agreement of all but the most extreme figures to join a broadly based regime under the duke's headship. When Henry VI recovered his sanity, however, at Christmas 1454, those in the household and the north who had opposed the protectorate seized the opportunity to assert their interests. York was removed from office on 9 February 1455, and by early March a more hard-faced government was taking steps against the duke. The fact that the Neville earls of Warwick and Salisbury also fell under attack at this time reveals the factional and divisive aims of those in control: although the government proceeded with the language of treason and obedience, its narrowing base and its sponsorship of conflict began to undermine its claims to such public goods; when York and the Nevilles confronted the king, Somerset, and the Percys at St Albans on 22 May 1455, there was a broad equivalence between the two sides, and the first blows of a civil war were struck. The Yorkist victory, however, brought this war to a rapid halt. Just as he had done in the early 1450s, the duke submitted to the king and attempted to rebuild unity. This was to remain his posture and that of his allies right up to the disasters of 1459. York was certainly prepared to strain his allegiance to its very limits—securing appointment to a second protectorate on 15 November 1455 and depriving the king of personal authority a week later—but he would not cross the bounds to an outright repudiation of Henry VI's sovereignty. As a consequence his pre-eminence remained insecure. His protectorate was soon terminated (on 25 February 1456) when parliamentary pressure for a resumption weakened his support among the Lords, but the aim of preserving unity, or oonhede, among the nobility lingered on for some years and ensured that if York was not to be admitted to any special power, he was not to be destroyed either. It seems likely that, provided he behaved himself, most of the peerage had some respect for the duke. Pressure from Queen Margaret and her growing band of partisans meant that he was obliged to repeat his submission of 1452 on a number of occasions between 1456 and 1459, but he was confirmed in possession of the lieutenancy of Ireland, and even seems to have been able to direct policy for a time in the wake of the ‘loveday’ settlement of 1458. Only in 1459 did the bulk of the Lords finally accept the case for war against the duke, and then the fault-lines of 1453–4 and 1455 were recreated and York received the support of the Nevilles. Rather as at St Albans, York, Warwick, and Salisbury revived the case that evil counsellors around the king were destroying the common weal of the realm and threatening their own security. On this occasion, however, their propaganda cut no ice: finding most of the nobility in arms against them at Ludford Bridge (near Ludlow, Shropshire) and deserted by a part of the army, York and his allies fled the field during the night of 12–13 October 1459. The duke and his second son, Edmund, earl of Rutland, spent the next eleven months in Ireland, attempting to gain the men and money for an armed return to England, where the duke's estates were in royal hands as a result of his attainder at the Coventry parliament (about the end of November 1459). His younger children, including George, were all placed in the custody of the duchess of Buckingham. An incidental result of York's efforts was the famous Drogheda parliament of 8 February 1460, in which the Anglo-Irish establishment obtained recognition as a distinct political community, separate from England, ruled by its own laws and financed by its own currency. In return for these concessions York gained resources, protection for his person, and an extensive army of archers, which he must have intended to take to England. Plans for a co-ordinated invasion of the mainland were apparently made during a conference with Warwick at Waterford in the spring of 1460, and the duke's Neville allies, accompanied by his eldest son, Edward of March, duly landed in Kent in June professing loyalty to Henry VI and protesting about the misgovernment of the realm. With startling success, they won support in London and the south-east and proceeded to defeat the royal army at Northampton on 10 July, submitting to the king at the battle's end. Over the next few weeks March and the Nevilles began to secure the realm and to await York's return, which finally occurred near Chester on or about 9 September 1460. Much about the next few weeks is obscure: it is not known why it took York so long to join his allies on the mainland; it is not known when he began so famously to assert his claim to the throne (13 September is the first date for which a plausible case can be made); it is not known whether or not the initiative had been agreed, or even discussed, with the Nevilles. It seems clear that there was no option for York but to attempt to make himself king: all other avenues, as has been shown, led nowhere; the duke could neither secure himself nor restore political order without taking the drastic step from which he had so far shrunk; and it may have seemed that by 1460 the polity of Henry VI was sufficiently dislocated to permit a direct assault on the king. Unfortunately for the duke, however, his own options were different from those of his allies, even his sons. These men had gained support on the old plea of reforming Henry VI's government. They had recently made their loyalty to the king explicit. As the managers of a large and diverse alliance, they could not easily abandon what they had promised, and it seems clear that the message from the London élite, who played an important role in the frantic politics of 1459–61, was that a deposition could not be tolerated. York marched into London, seized the king, and entered parliament on 10 October, announcing that he intended ‘to challenge his right’ to the crown (Johnson, York, 214). The Lords' response was unpromising: they went into conclave at Blackfriars and sent the young earl of March to persuade his father to accept a negotiated settlement. By 13 October York had been brought to abandon his plans for an immediate coronation, and a few days later he submitted his claim for discussion in parliament. An accord emerged on 31 October, and its central feature was to leave Henry VI on the throne, while settling the succession on York and his sons. It is possible that even after this York attempted to get his way by inducing Henry to abdicate. He must have realized that, like the treaty of Troyes on which it was apparently based, the accord promised immediate war with the disinherited heir. In any event, the king was moved to safety and the duke was obliged to accept the terms agreed in October, at least for the time being. Acting more or less as protector he marched north in early December to deal with the forces of the prince of Wales and Queen Margaret, which had regrouped in Yorkshire after the defeat at Northampton. Venturing forth from his castle at Sandal on 30 December 1460, in what may have been an uncharacteristic attempt to surprise his enemy, York was set upon by an unexpectedly large Lancastrian force. In the ensuing battle of Wakefield, he and his second son, Edmund of Rutland, were killed. As a macabre riposte to Duke Richard's recent pretensions, his head was severed from his body and displayed on the walls of York bearing a paper crown. So ended the life of this curious figure, who, having played safe in the prime of his years, abruptly changed tack at the age of thirty-nine, pursuing ever more ambitious and dangerous policies until, with victory almost in his grasp, he fell on an ill-chosen battlefield. Duke Richard was the true founder of the royal house of York, but despite a career that a recent biographer has described as ‘the most successful failure of the middle ages’ (Johnson, ‘Political career’, abstract), he has inspired little interest and even less sympathy among historians. Notwithstanding his many claims to be acting for the ‘common weal’ of the realm, York has usually been presented as a somewhat colourless bungler: all along, it seems, he wanted power, but he could not decide how far to go until the last minute, whereupon—fatally—he went too far. In 1964 B. Wilkinson set the tone for most modern accounts of the duke's career with his judgement that ‘it would be folly to make a statesman out of this fifteenth-century worldling’ (Wilkinson, 88). This view seems unfairly harsh: like many of his peers, his instincts were to make the best of things in Henry VI's England, a world in which there were no easy answers. York's opportunities were closely circumscribed and his intentions in opposing Henry VI's government are far from clear; in fact there may be a case for seeing him more as the victim of circumstances than as their creator. His cautiousness, if ultimately unproductive, was justified by the sheer impropriety of opposition to the government. On the other hand, the recklessness that he demonstrated in 1450, 1452, 1455, 1459, and 1460 was also justified: sometimes by its results; always by the need to do something to restore the authority that the king, in his feebleness, had frittered away. In medieval England, however, the restoration of authority could only be carried out from the throne. York's final and most destructive venture was thus his best-conceived one, but it is easy to see why it has won him few plaudits.